Introducing Smart Candy: A Sweet Deal! Our team at E-Port Interactive Media is delighted to introduce you to a product that is certainly generating a lot of buzz! Smart Candy: a new and innovative way to increase your business! Smart Candy is a savvy, unique way to capture a new audience utilizing a 7 x 9 inch custom decal in your store front window, on your vehicle wrap or in a smaller variation on your business card. 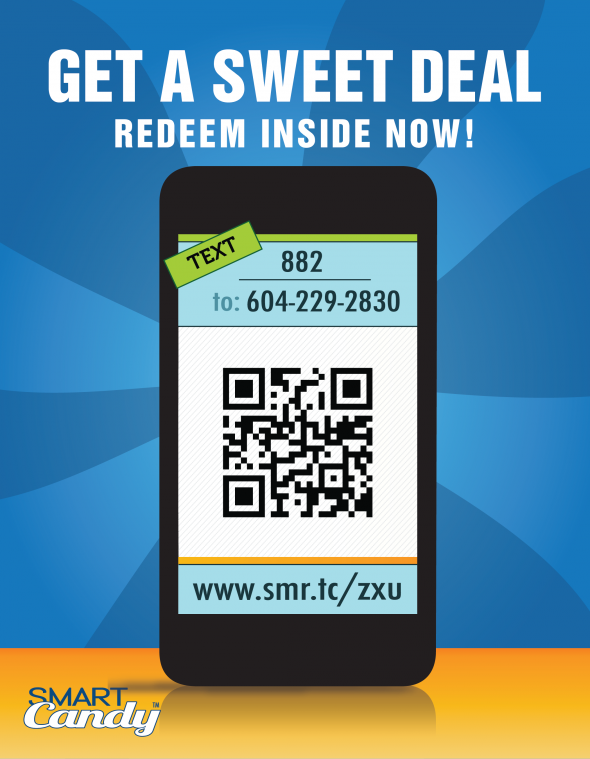 Smart Candy is simple; your new customer either scans the smart phone QR code found on the decal or text messages the affiliated number located on the decal to receive an incentive (redemption, discount, VIP invitation, etc. of your choice). Smart Candy also provides the opportunity to cross promote with businesses near and around your area by featuring your company’s link alongside all of our participating businesses. We offer full support and assistance with social media, setting up your incentives and promotion at local events and festivals in your neighbourhood (look for us in Vancouver at the Khatsahlano Music & Art Fest in Kits July 21st and the Pride Parade August 5th!). AND on top of all this, Smart Candy is affordable! The cost works out to be about as much as a modestly priced dinner for one. Contact us to sweeten up your marketing today!